The structure of CB1–AM841 complex is shown with the receptor displayed as green ribbons and the agonist ligand AM841 as pink sticks.Image courtesy of Hua Tian, iHuman Institute, ShanghaiTech University. Science supported by the National Institute on Drug Abuse (NIDA) has revealed three-dimensional crystal structures of the cannabinoid receptor 1 (CB1) in its activated state. Researchers used X-ray diffraction crystallography to determine CB1 structures when the receptor was activated by two molecules with similarities to Δ9-tetrahydrocannabinol (THC), the psychoactive ingredient in marijuana and related drugs. The differences between these structures and the already-known structure of the inactive receptor shed new light on how those drugs and cannabinoid neurotransmitters produce their effects. The findings provide medicinal chemists with valuable clues for designing medications to regulate those effects. Molecules that target CB1 receptors may have promise in treating a variety of conditions such as pain, inflammation, obesity, nerve cell diseases, and substance use disorders. The new findings can greatly advance the development of new medications that work upon the cannabinoid system to improve health. Hua, T. et al. 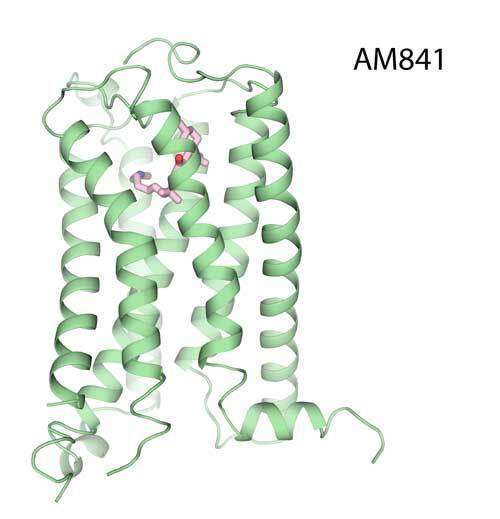 Crystal structures of agonist-bound human cannabinoid receptor CB1. Nature. www.nature.com/nature/journal/vaop/ncurrent/full/nature23272.html.